With the ease of say, New Yorkers griping about train delays, NASA employees discuss encounters with boars and bald eagles, raccoons and rattlesnakes, bobcats and buzzards. It's a wild place. But the oddest part of the encounter? At NASA HQ, this type of thing happens all the time. When Modern Farmer visited KSC for our story on space farming, we overheard some weird water-cooler talk. With the ease of say, New Yorkers griping about train delays, NASA employees discuss encounters with boars and bald eagles, raccoons and rattlesnakes, bobcats and buzzards — you get the drift. In the ’60s, NASA bought 145,000 acres of coastal Florida property — but only needed 6,000 for the space program. They wanted to keep the rest undeveloped, an effort to spare human lives if a spacecraft crashed. The surplus acreage became a sanctuary called the Merritt Island National Wildlife Refuge. And deep inside its teeming, semi-tropical core, NASA built a bright, sprawling campus of labs and admin buildings. It’s like putting an office park in the Amazon, a surreal intersection of the primal and the modern. Morning commuters wait as bobcats cross the roadway. Shuttle launches are stalled by armadillos. Woodpeckers poke holes in fuel tanks. To be fair, most of the animals live their lives peaceably while NASA goes about its business. But some issues keep coming up again and again and again. 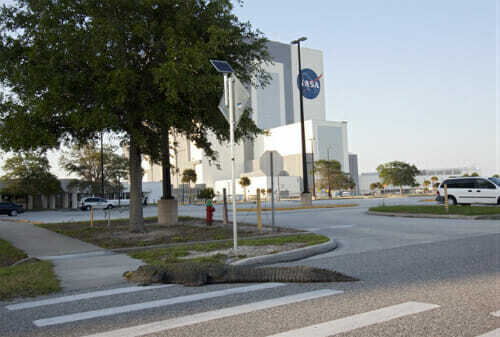 Incredibly, only a handful of humans have been bitten on KSC property; Lloyd says these gators are typically “provoked” in some way. 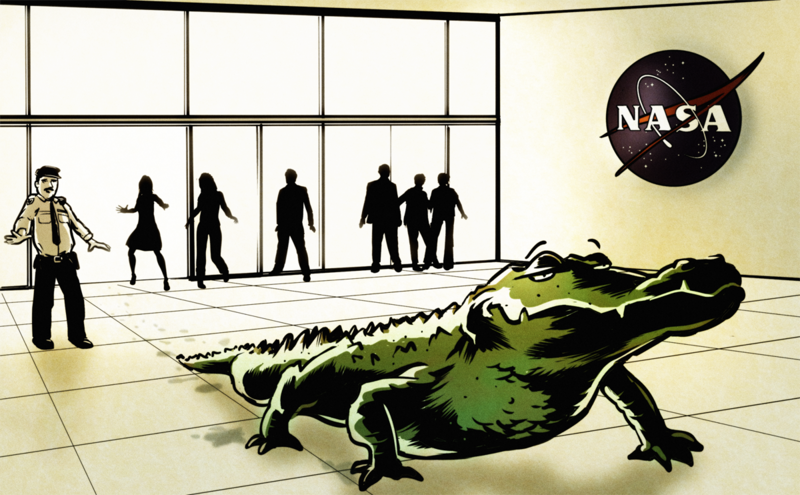 NASA employees are cautioned to keep alert when outdoors (occasionally inside, too), and never feed the alligators. Also, check under your vehicle before getting in. 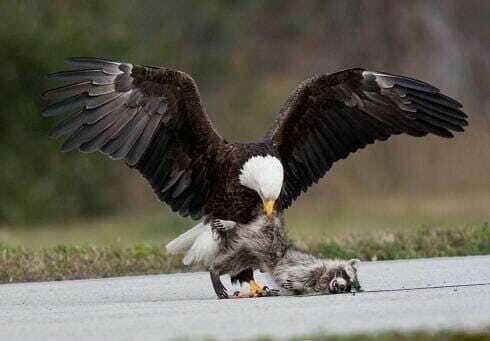 A bald eagle grabs dinner at KSC. A trio of wild pigs near the security gates. A gator wanders the grounds. Osprey nest in front of the Vehicle Assembly Building. McCoy used to take midday strolls down a trail near her building. One day during lunch, she was walking with some co-workers. 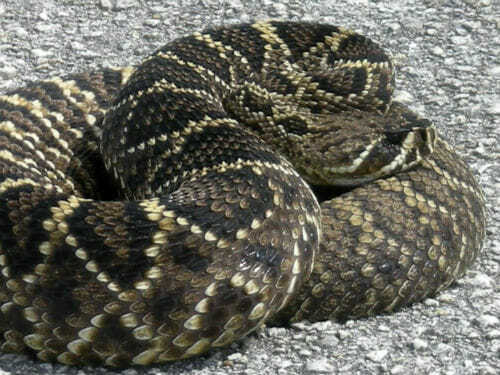 They turned a corner and boom: On the middle of the trail was an eight-foot diamondback snake, thick as a forearm, rattling and hissing. They backed away slowly, and no one was hurt — but that marked the end of the nature strolls. 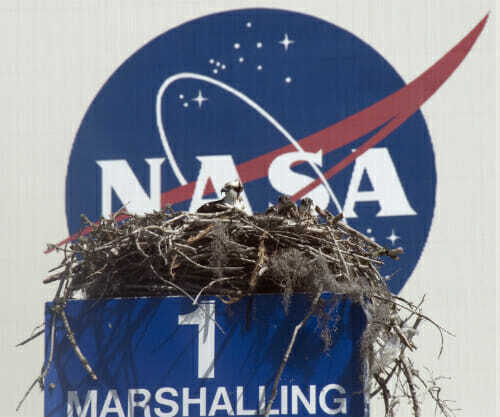 After that buzzard (in this case, a turkey vulture) plummeted to the Earth, NASA instituted a serious vulture eradication program. The centerpiece of this plan? 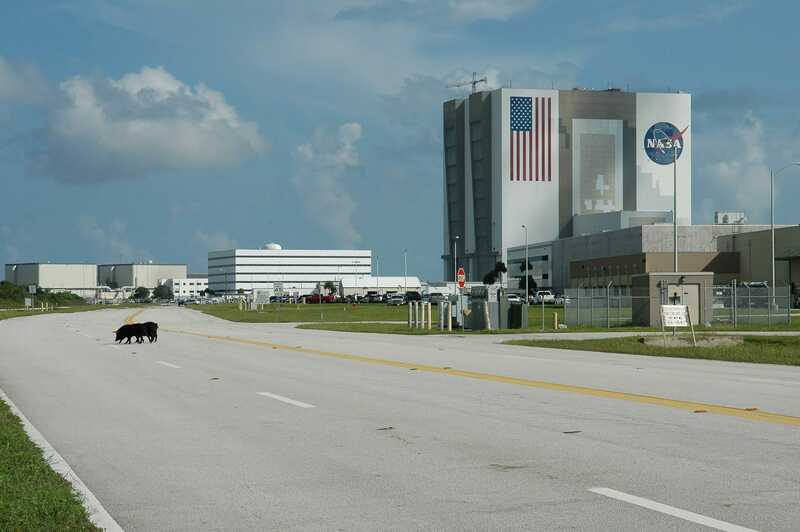 To remove KSC’s 1,000 pounds of roadkill each month, thus decimating the birds’ food supply. Lloyd says the program wasn’t too effective — buzzards get into the Vehicle Assembly Building all the time, a major hassle to remove. They also love attacking people’s cars, eating insulation, gaskets and the rubber lining that surrounds windshields. “I have absolutely no idea why they do that,” says Merritt Island refuge manager Layne Hamilton. Like much of Florida, wild pigs are deeply entrenched in KSC property. They’re a nuisance — destroying lawns and flower beds and freaking out tourists at the visitor’s center — but a nuisance that can’t seem to be stopped. Hamilton says their trappers kill upwards of 2,500 wild pigs every year. With all the wildlife roaming NASA’s spaceport, it’s understandable why astronauts are so eager to take off. Shuttle launches are dangerous, and space is a deadly cold vacuum, as inhospitable a place as exists in the universe. But at least there’s not gators.